Large roll ball mill is a kind of equipment used for ultra-fine macerating and mixing for batch production, which is also called rolling machine altar. The machine is preferred equipment for scientific research, teaching, experiment and production due to its advantages such as beautiful design, compact structure, easy operation, high efficiency, and uniform granularity. It is widely applied to industries of electronic material, magnetic material, biological medicine, ceramic glaze, metal powder, nonmetallic minerals, new materials, and destruction of plant remnants, such as Cannibus after harvesting, etc. Produces 79.25. gallons. When ball mill works, the macerating media and the materials of the cylinder are rotated to a certain height. Due to the gravity, they fall down from the tube wall. The materials are crushed by impact action of the macerating media, and friction and shearing action of macerating media’s rolling and sliding. 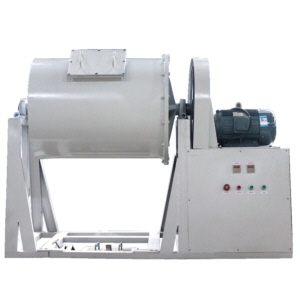 Optimal design of rotating speed is adopted in the machine, where mill jar is dragged to rotate by rubber roller, balls inside the jar make incline flow movement and disperse materials, thus it obtains best effects of macerating. As result, materials are ground to micron powder. Timing control panel is adopted in the machine with controlling functions of pausing and cumulative timing, and you may set working time according to requirement at any time. It saves time and labor, and is easy for operating. The machine is extensively applied to in the fields of Agronomy, Construction Material, Ceramics, Environmental Protection etc.